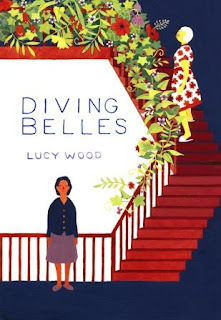 Diving Belles, a short story collection, will be released on August 7. I read the first story over the weekend and found Wood's voice and writing style to be very engaging. What do you think of the intro? *This quote is taken from an Advance Reading Copy, the final product may be slightly different. I like the narrator's voice, and we can totally visualize Iris. I'm curious about her story with regard to the diving bell. Laurel-Rain Snow - There were some magical/mythic elements to the story... very enjoyable! Very descriptive! I like to have short story books hanging around for a quick read. Nise' - Exactly. There are times when a short story is exactly what I crave! Paulita - I'm enjoying the second story now, too. Eee, I love this intro which is great b/c I'm reviewing this book later in the month. The cover is so fantastically quirky, isn't it? Audra - I nearly squealed with delight at the cover - love it! Diane - Great intro, great cover... I'm thinking this will be a winner! I love that bit, so descriptive. And I have to agree, the cover's great. Carol - I'm hoping the rest of the stories are just as good as the first! I hadn't seen this one around yet - love the cover! I liked the intro...I would keep reading!